With regard to the idea of whether you have a right to health care, you have realize what that implies. It’s not an abstraction. I’m a physician. That means you have a right to come to my house and conscript me. It means you believe in slavery. It means that you’re going to enslave not only me, but the janitor at my hospital, the person who cleans my office, the assistants who work in my office, the nurses. His argument, such as it is, is succinctly, and handily refuted here, but I have another small issue with this. Why are Right Wingers always using the language of America’s troubled racial history to make their points? Always with the slavery too. And then there’s that whole billboard thing. My only guess is that they’re taking a page of the Luntz playbook and turning their weakness into a strength. By comparing things to what Black people have suffered they can join in the oppression. Oppression being way more authentic than subjugation after all. Are they just getting hip to playing the victim? Are they subconsciously preparing for Majority Minority? 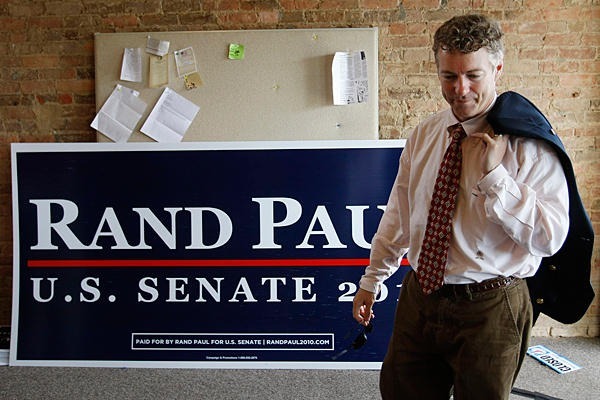 Is Rand Paul really just a white Al Sharpton? Are White People the new Black?